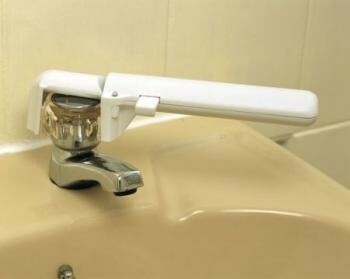 This ingenious device clamps around the top of cylindrical tap tops, and provides the leverage to turn them easily. This ingenious device clamps around the top of cylindrical tap tops, and provides the leverage to turn them easily. The barrel of the handle is spring loaded to allow the jaws to clamp down on the tap, which is gripped by soft non-slip rubber linings in the jaws. The jaws can also be locked in position. The handle is comfortable and easy to grip. For use with taps up to 60mm (21/2") in diameter.